There's not much in music that's as exciting as when a new teen pop sensation bursts onto the scene. Love them or hate them, boy bands, girl groups, pop princesses and Justin Bieber have all had a massive impact on the charts over the years - and this week in 1988, the latest British teen stars cracked the Australian top 50. Naturally, radio refused to play their songs and so it was left to music video shows, of which there were now a handful, and pop magazines like Smash Hits and TV Hits to whip Australian teens into a frenzy over the trio. And a frenzy there very quickly was. Meanwhile, at number 1 this week in 1988, fellow teen star Kylie Minogue settled in for the long haul, with "I Should Be So Lucky" showing no signs of giving up the top spot any time soon. A second minor top 100 entry for the band eventually behind "Closer To Free", "Only Love" was taken from BoDeans' Jerry Harrison-produced second album, Outside Looking In. Described in Who's Who Of Australian Rock! as a "sarcastic arrogant rock band", this short-lived Sydney punk outfit was fronted by singer Johnny Teen (real name: Robert Gale), who the single claims was the "first Australian to undergo genital silicon implants". In the US, this was the fourth top 10 hit (of five) by the pop group comprised of eight (of 17) Wolfgramm siblings. Also worth checking out: "Cross My Broken Heart" and ballad "You Got It All" (later covered by Britney Spears). Before we get to Bros, we have a couple of old codgers to get through - and here's a guy who'd been making music since the mid-'60s. John's big breakthrough came with 1971's "Take Me Home, Country Roads", and he had two top 10 hits shortly after that in Australia with "Annie's Song" and "I'm Sorry / Calypso". Fast forward to 1988 and it had been six years since John had scored a top 50 single in Australia, although his albums had continued to do well. "For You", a ballad from his Higher Ground album which was actually recorded in Sydney, would spend exactly half a year in the top 100. It would be John's final hit in this country before the 1997 light plane accident that claimed his life. The performance below is taken from the Bicentenary concert I talked about a few weeks back, since I'm pretty certain there was no official music video for this song. From 44-year-old (at the time) John Denver, we come to the 42-year-old Roxy Music singer with the second single from his Bête Noire album. It wouldn't perform as well as "The Right Stuff", but was another cool and sophisticated pop track I quite liked at the time - and still do. 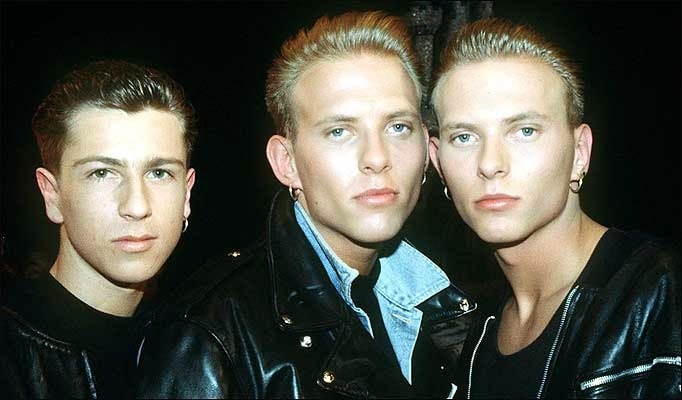 The Doc Marten-clad, ripped jeans-sporting trio comprised of twins Matt and Luke Goss, and Craig Logan tempted fate with the title of their breakthrough hit, since it did look for a short time like the pop group might never find fame. "When Will I Be Famous?" wasn't actually Bros' first single - they'd debuted in the UK with "I Owe You Nothing", which would eventually become a hit (there and here), but tanked first time round, only managing to get to number 80 in August 1987 in Britain. "When Will I Be Famous?" was the follow-up and it also originally missed the UK top 40 in late 1987. A timely post-Christmas push sent the song rocketing up the UK charts, and by Feburary, it had peaked at number 2. Finally established at home, Australia wasn't too far behind (for once) and local teenagers quickly sent the track into the top 5. It would be the first of many appearances Bros would make on the ARIA chart before the year was out. There was no stopping Dirty Dancing in 1988. 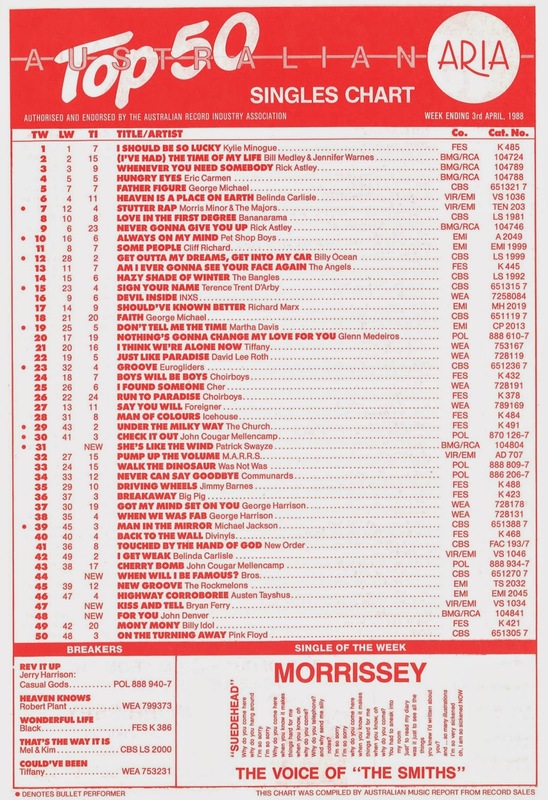 With the first two singles taken from the soundtrack still lodged in the top 5 this week 25 years ago, a third single leapt into the top 50 to become the week's highest debut. And, it was by the film's leading man, no less! I doubt many people would have expected Patrick to become a chart star, but "She's Like The Wind" gave him a top 10 hit in Australia, as well as a three-week number 3 in the US, where female vocalist Wendy Fraser received a featuring credit for her contribution to the soaring ballad. Turns out the track was actually written for a previous film Patrick had starred in - 1984's Grandview, U.S.A. - but didn't end up getting used, and so that film's loss became Dirty Dancing's (and the world's) gain. Next week: solo projects from members of two of the most influential groups of all time and another teen sensation from the late '80s charts with her second single. I wasn't religiously viewing the rage top 50, at least not the full chart, at this point, so can't recall what they did for 'For You'. I also assume there was no proper video. An interesting thing you haven't mentioned about 'Kiss and Tell' - Mandy Smith appears in the video! Being at the right age, my older sister was a big Bros fan in '88. 'She's Like the Wind' is nice, especially with the female vocal, but not really that exciting.